When planning on leaving Andorra we had been trying to work out what next. Truth to tell we hadn’t been chased away from the mountains as soon as we’d expected. The autumn of our pessimistic imaginings, beset with rain and snow had, in reality, turned out to be mostly sunny and cold. And we’d been so busy enjoying the mountains that we’d given no thought to our original plans to visit inland Spain and get as far as Madrid. Even knowing that we had less than six weeks before our ferry home wasn’t enough to persuade us to drag ourselves away from the Pyrenees. 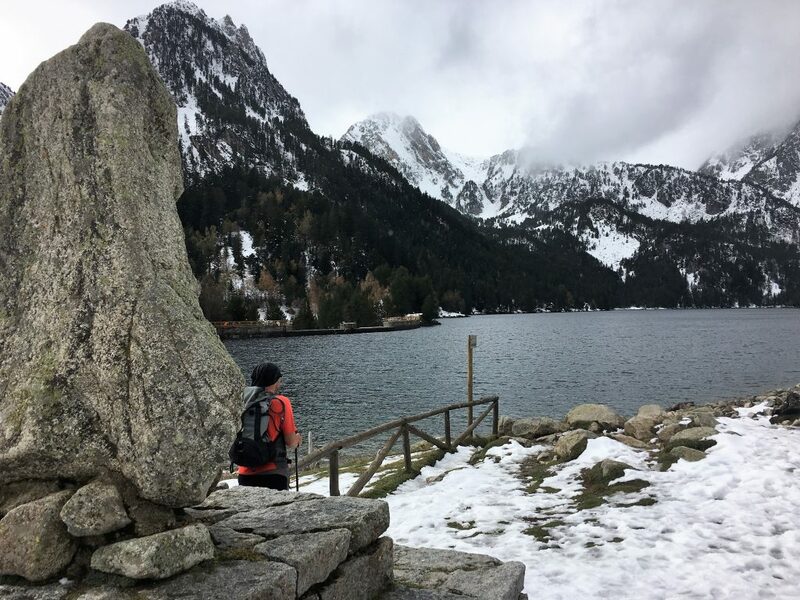 We would visit the Aigüestortes I Estany de Sant Maurici National Park before reassessing our plans. 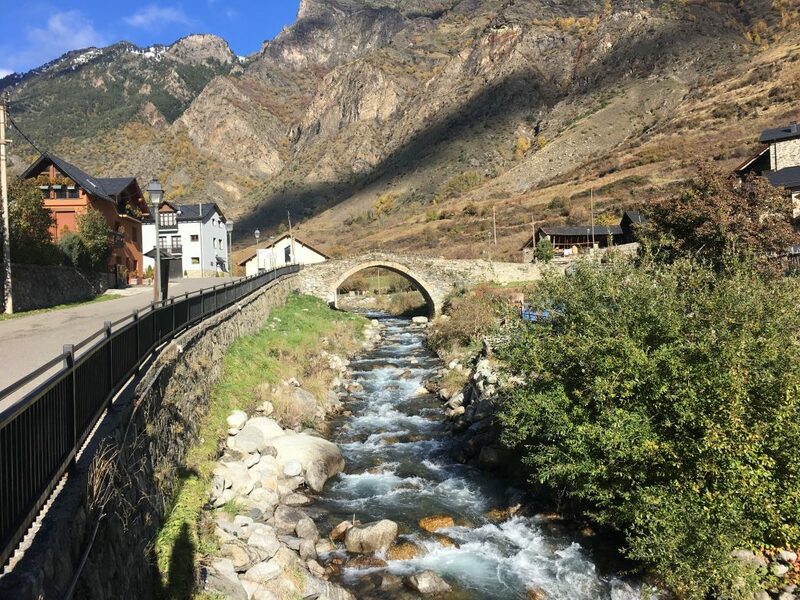 This is one of two National Parks in the Spanish Pyrenees (there are National Parks and Natural Parks, and then just the rest of the mountains) and because of the National Park status it has particular protections, including vehicular access to the park area. We wouldn’t be able to (nor would we want to) drive the trails into the park itself, those are the preserve of the authorised four wheel drive taxis, nor would we be able to drive to some of the car parks on the edge of the park due to our size (a lot of the roads have a 2m width restriction). Despite this we were hopeful that we would find hikes we could do from car parks we could access. Our other practical planning concern was access to motorhome services. 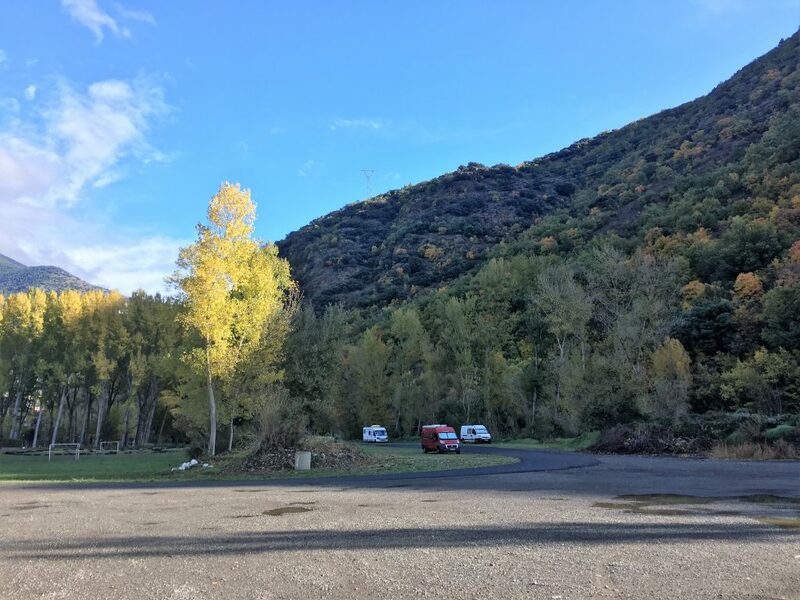 November is the month of preparation and repair for many of the campsites in the area so nearly all of them were closed. Plus there aren’t huge numbers of motorhome parking spots with services. We did a little research and had some likely areas targeted and, with a bit of doubling back, we knew we could enjoy the lowest of the low season in this area. So our first stop was Rialp, which is where you would have found us on the morning of November 9th. This town just outside the south east corner of the park has a motorhome service point and large area of parking alongside the river and near their football field. It was a really peaceful spot for sleeping and we made sure to empty and top up before we left. The garage across the road was also a small Dia supermarket where we picked up a few supplies. We were all set for our first destination – Espot. Maybe Espot wasn’t quite ready for us. Our journey was interrupted twice as we travelled this scenic road next to the river. The first time we came to a halt in a small queue of traffic, as we crept round the corner we saw a few fluorescent jacketed individuals standing in the road. One person directing traffic and the others looking in consternation up the cliff to our right. 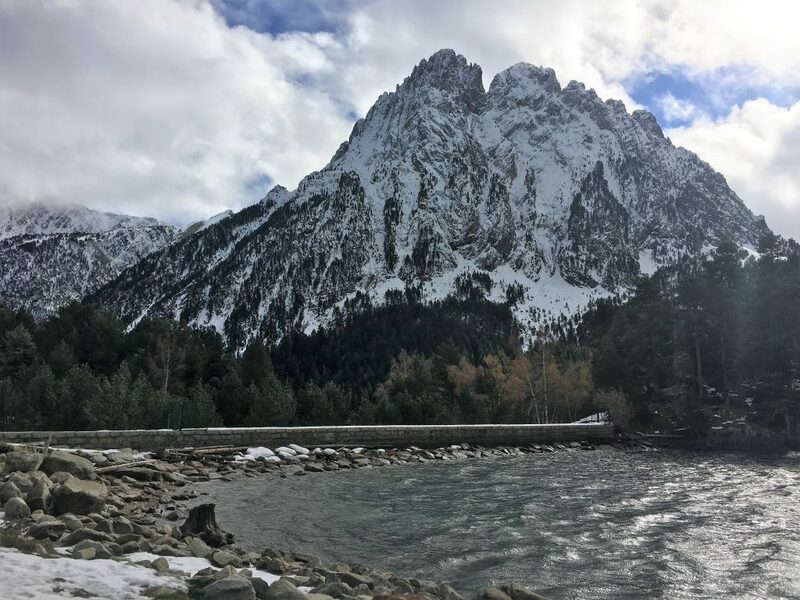 A couple of people were let through and then a hand was waved and traffic was stopped, a slow trickle of rocks dribbled out from underneath the avalanche/rockfall protective netting, and then a few more. As an encore a head sized slab of slate bounced out from under the netting, rising up a couple of meters before coming down next to a man in an orange jacket who looked at it with that kind of bemusement that you get when you know you’ve just dodged something life threatening and there was no way you could have avoided it if your number was up. When we were finally allowed to edge past the rockfall everyone was standing a little further away. We held our breath and hoped that Bertie’s rumbling weight didn’t precipitate any further falls. It looked so innocuous, the avalanche netting holding most of the debris back apart from a small mound of stone. It’s another reminder of the power of the mountains. 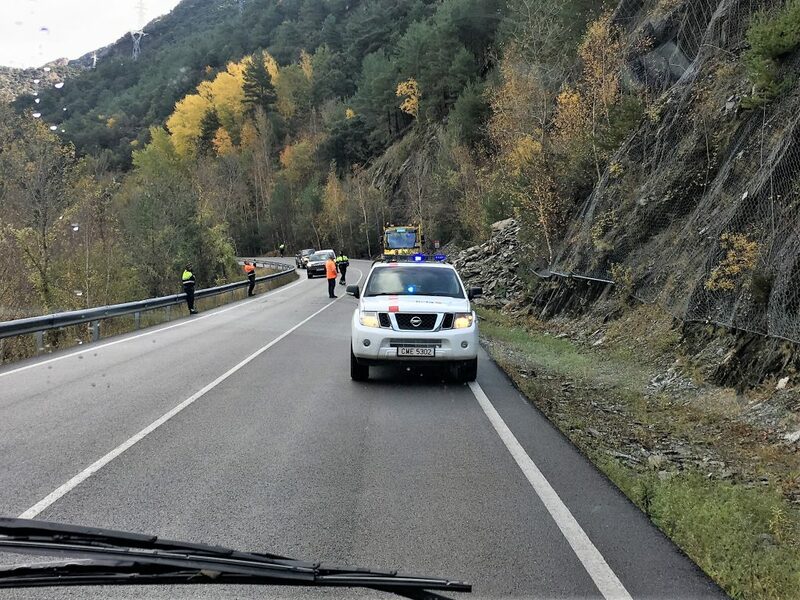 The second interruption to our journey was far less frightening, although the flashing lights of the police car heading our way worried us at first. The policeman waved us down from his window and asked if we spoke Spanish. With my reply of ‘un poco’ he obviously decided that it would be better to speak English. He obviously knew that a British person’s definition of ‘a little’ would probably only enable them to get by in a restaurant and campsite. 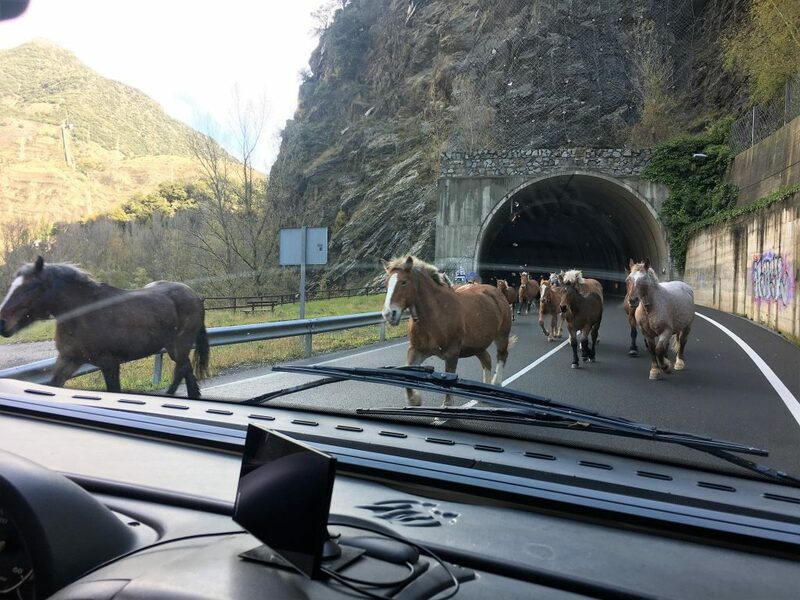 Anyhow, the reason for the flashing lights was the approach of a herd of horses (I do actually know the word for horses – so there) being ushered down from the mountains to lower pastures and possibly the abattoir. I don’t know much about the farming of horses in the Pyrenees but I do know that many are now bred for their meat. Eating horse meat is something that feels wrong to many British people, but now we no longer rely on them for transport, using them for meat is the main reason why you still find so many herds in the mountains. The horses came out of the tunnel ahead of us, probably a couple of hundred, some spirited and restless, some young and nervous, others old and weary and one final lame horse that really didn’t look like it should be taking the journey at all. With the horses all through we could carry on uninterrupted to Espot where we parked for the moment in the large parking at the entrance to the village. Overnight parking is not allowed here but I wanted to pop into the tourist office and see if I could pick up a map. The lady in the tourist office provided me with a free map of the key paths but I spotted that they had a 1:25000 map of the park for sale and I wanted it! Because of the restrictions on parking in the village we were heading up to the Espot ski area where we would spend the night. We drove round the extensive parking a couple of times trying to find the most level spot before settling in behind the amber leaved trees. 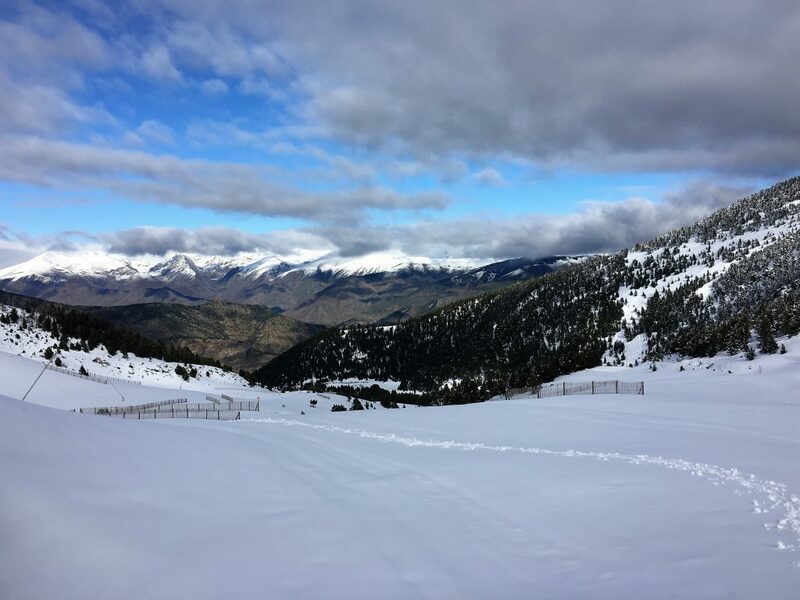 Our afternoon activity was going to be some more snowshoeing, this time following the marked ‘Les Picards’ circuit up the ski slopes to the Estany de la Bassa and the viewpoint above. First of all we had to walk the 3 km from the car park to the mid station, an easy walk up a track with signposts. After about 2km the snowshoes went on and we continued up the track until we found the first of the red lollipop signposts that mark the snowshoe route. The only downside of this short route was the lack of anywhere to sit and drink our hot drinks. Everywhere was covered in snow. In the end we brushed off the steps at the top of the ski lift and sat on the rather cold metal while we watched the start stop of the ski lifts as down below each chair was being lifted onto the wire. On the way down we spotted finally spotted some wildlife, a small group of three Isards jumping across the track to drink from the stream. It was a cold evening, we had the heating on but the lack of sun had left us with only partially charged batteries to run the fan that blows the warm air around so we had yet another drive around the parking area to try to inject some life into them. The hot water bottle was a welcome addition to our bed that night. The following morning we drove back down to the parking at Espot, we were going to walk one of the main routes in the park to the Estany de Sant Maurici. We weren’t able to drive up to the next area of parking so our choices were to either walk from the village, or to get a taxi up to the next parking spot or even to get a taxi all the way to the lake and walk from there. We chose to save our money and walk from the village, the taxi service was going to be busy anyway on this pleasant Saturday, we could tell from the number of people turning up in their everyday clothes including one coachfull. Initially this walk, which follows the GR11 route throughout, starts on the road that leads up to the next parking area. After a couple of km we were able to take the path to the right that led along the back of some fields amongst rocks and occasional trees. 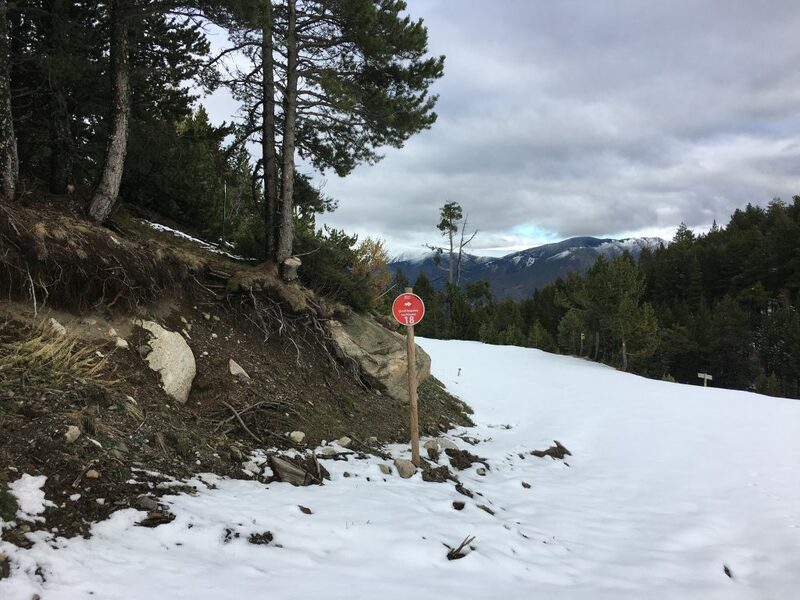 The lady in the tourist office had informed us that there was no need for snowshoes on the route as it was so well trodden and this lower section, much less well trodden, was completely free of snow. We didn’t see anyone on the first part of the walk which was lovely and peaceful, just the occasional whinny of a horse in the fields and the unceasing murmer of the river below us. Vultures wheeled silently above the walls of the valley and small birds flitted from tree to tree. The path from the upper car park joined our route in an open valley where the terrain levelled off for a while and the river flowed past in gentle meanders. There were a lot more walkers here and we could also see the road and the steady stream of 4WD taxis ferrying people all the way up to the lake. There was more snow here, the path either clear or compacted snow (or ice in the shady spots) and the snow increased gradually as we ascended again through pine forest up to the lake. 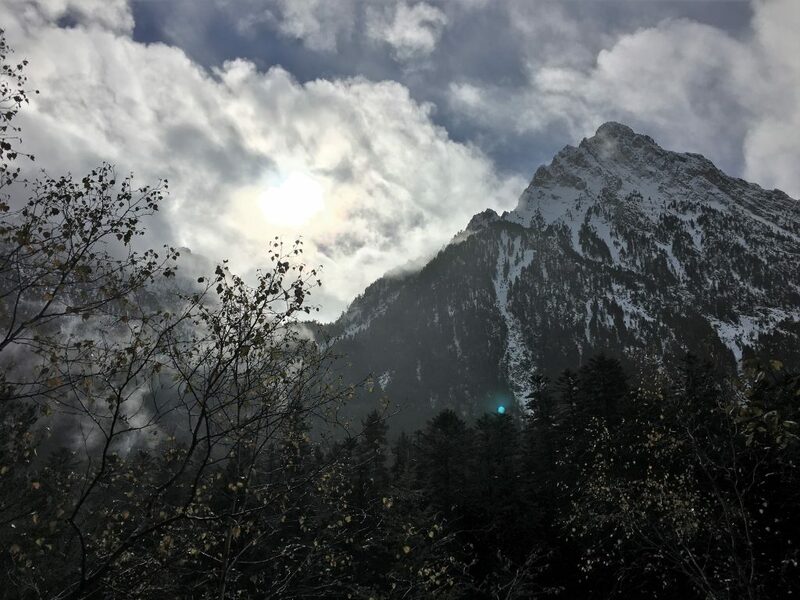 The jagged peaks to the south, including the very distinctive triple peak of ‘Els Encantats’ – the enchanters, were blocking the sun and it was getting pretty chilly. Our stop at the lake to eat lunch was brief as we didn’t want to cold down too much. We turned around to retrace our steps, we would stop again to finish our lunch when we got somewhere with a bit more sun to warm us. Back at Bertie in the parking area we found a wallet and handed it in to the taxi office as the park office was shut until four. Hopefully the owner got it back again, it had their ID card in so fingers crossed they could be tracked down. We waited in Bertie while we had a warming cuppa wondering if the owner would turn up, but there was no sight of them. Due to the cold we decided to head back to the lower altitudes of Rialp that night and prepare ourselves for our next foray into the park.